People are scared by big numbers. But what do those numbers actually mean? Time Magazine recently featured this as its cover. And it is absolutely, positively, catastrophically, stupid. Here's why. Our debt is actually just government bonds that our Treasury issues to people, banks, businesses and other countries etc., and a profit is made off of the bonds because they generate interest. For example, if you were to buy a 1-year bond for $100 with a 5 percent interest rate, you'd get back that 100 dollars, as well as the five dollars generated from interest. A bond can be issued for as long as 30 years. When the bonds time is up, it has "matured". And until the bond has matured, The United States only has to pay the bond holder the interest, not the actual cost of the bond. And in many cases, a matured bond is just rolled over into the form of another bond. Here's why this is all good news. Interest rates are near 0 percent right now. So paying for bonds/taking on debt is incredibly cheap, easy and worthwhile right now. 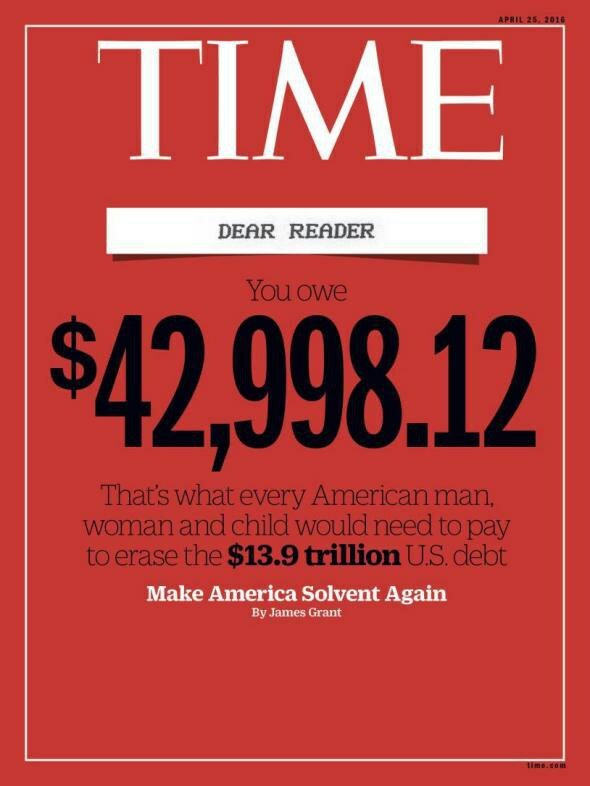 Yes, our debt is a lot of money. But so are our assets. Of course, you don't want that debt to become unsustainable. Whether it be the interest rate, or the debt itself, those numbers are entirely irrelevant unless you scale it to our ability to pay it off. For example, many students go into debt by taking out a loan to go to college. And the debt we take on is worth it because the careers that we go into after graduating will make us much wealthier in the future, and our new generated wealth then goes back into paying back our loans. It's the same way with our government. Except it's a little better. People have to pay back their debts. Governments don't. This is because governments aren't people and they won't die in 80 years. So they can have debt for as long as they want, they just have to make sure that the value of their assets is greater than the value of their debt. When the government issues a bond and uses that bond money to build a bridge, the government not only has more debt, but it also has more bridges. And those bridges generate a return on investment, and sometimes that return on investment exceeds the amount borrowed. So in a weak economy, governments borrowing money to spend on a project with a much higher return on investment, is actually a very good thing to do, because the value of assets that the government acquires would be much greater than the value of our debt. If the government finds things to invest in that'll have a higher return rate than a bond's interest rates, it should continue to issue bonds and run deficits rather than taxing people to fund those projects directly. This is a strategy we should be using right now, considering that interest rates are at historic lows, and there are several projects to invest in with return rates of well over 8 percent. And when the economy grows as a result and has fewer things to invest in, they can take advantage of the broadened tax base, and run surpluses. But this should only be done in a healthy, recovered economy. As long as the government keeps the value of its assets greater than the value of its debt, then the government will remain solvent and will continue to function. So not only is the national debt not a problem, but it's actually something that we need right now.